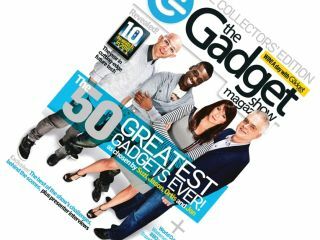 The Gadget Show Magazine will hit the newsstands on Thursday, with the one-off collector's special bringing all the coolness of Five's popular technology show to print. Featuring content from presenters Jason Bradbury, Suzi Perry, Jon Bentley and Ortis Deley, the magazine is being published by Future – the publishers behind TechRadar. The mag will cost £5 and includes a run-down of The Gadget Show team's 50 Greatest Gadgets Ever (we're hoping that the wheel makes an entry) and ten cutting-edge pieces of tech to watch out for in 2010. Nial Ferguson, Publishing Director for Future's Technology Lifestyle & Entertainment portfolios said: "Since we announced The Gadget Show Magazine special earlier this year, we've seen a real buzz among The Gadget Show fans and huge interest among commercial partners for the title. "That just shows how valuable and relevant print can be, if you get the proposition right. "We've combined Future's unrivalled expertise and experience in the consumer tech sector with The Gadget Show brand and the team's enthusiasm, passion and unique insights, and produced a magazine that is truly special. Emma Derrick, Five's Commercial Development Controller added: "Our ambition is to take The Gadget Show beyond the confines of TV and develop it into a major consumer technology brand. "The Gadget Show Magazine takes us into print for the first time, and we're delighted with the end product, it looks fantastic. "I really hope all of the show's fans enjoy it." You can buy The Gadget Show magazine here.